Ellison, N.H. (1966). Auster Aircraft – Aircraft Production List. Air-Britain (Historians) Ltd. ASIN B0041OQAEG. Hitchman, Ambrose (1989). 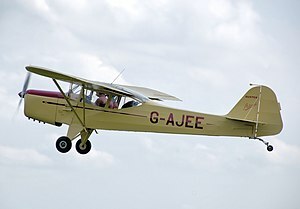 The History of the Auster Aeroplane. International Auster Pilot Club. ASIN B0019BV2YM. Jackson, A.J. (1974). British Civil Aircraft since 1919 Volume 1. London: Putnam. ISBN 0-370-10006-9.